mentioning what the old called the "enemy line" coming from the uppper Mars is a very good point. I would add the ending of the main Apollon line on the Apollon mount, not ending at the base of the finger, though there is another, weaker but longer A.line beside. It may mean that his name will last in any kind. - We see, that there is no really affect on the life line now at this date - therefore my interpretation. As I learned on this case, it's not easy to decide what force or event will be dominant. Although a foto usually shows not all information. mentioning what the old called the "enemy line" coming from the uppper Mars is a very good point. I would add the ending of the main Apollon line on the Apollon mount, not ending at the base of the finger, though there is another, weaker but longer A.line beside. It may mean that his name will last in any kind. - We see, that there is no really affect on the life line now at this date - therefore my interpretation. As I learned on this case, it's not easy to decide what force or event will be dominant. Alhough a foto usually shows not all information. A common misconception is that the length of the Life Line tells the length of your life. It does not. Good Life Line shows good constitution. Shorter deep line shows the great health and vigor and vitality that will last only for the period till this line lasts. I do not believe that length of a person’s life line is tied to the length of a person’s life. This line has nothing to do with the age of the person. Life Line shows natural health and vigor of the subject, where death is marked at another places too such as on the Heart Line, HEAD LINE, Mercury Line and remember that death is also shown by chance lines, individual signs too. Good lines furnish better channels through which the Electric Current can flow for free circulation till such lines last. On his head line a star suggests what I expressed in my earlier post. And I see no sign of protection attached to it and every line suggesting he would gradually lose drive energy and control on the situations. Life Line do suggests senile fast approaching. I agree with you that public palm pictures cannot reveal all things. thak you for your commend. I didn't think or wrote about the correlation of the length of the life line and death. But usually important life events or interferences show any deeper effect on it. Parender wrote: Termination of success line is very important. A very strong Apollo line is terminating at the mount of Saturn under the middle finger on his palm of the hand. The sunny bright confident approaches to rich life will turn in to sad event and hence he was destined, qualified or entitled to a serious, gloomy dingy end of life. Are you considering his main fate line as sun/apollo line ending on saturn mount? 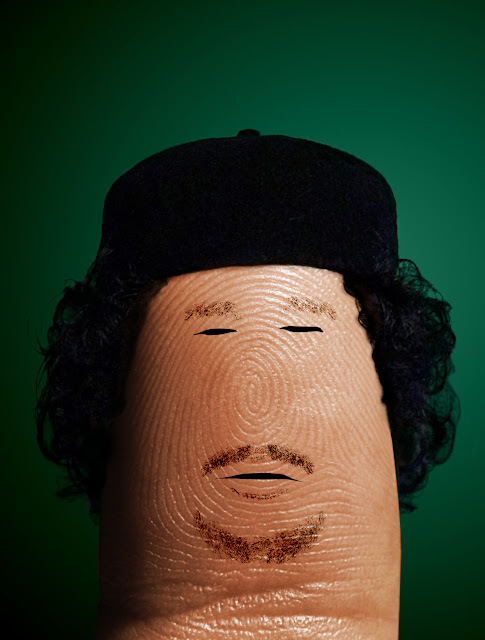 Ditology fingerprint art, including Colonel Muammar Gaddafi + many other celebrities! As per Picture added by Caprie . Gaddafi has Vriksha Rekha in Hast Samudrik Shashtra The Indian palmistry These Lines are called Vriksha rekah By Vriksha I mean tree Like lines . Sun Mercury Saturn lines all are going straight this yoga or combination makes one a Ruler if not ruler then a very successful man in life . Normally we do not get to see these lines commonly . Gaddafi Lower Mars is week in this picture but he was a violent man . Normally our mounts get week as per age . I agree You can not true file picture . I think for a study like palmistry studying really famous leaders/stars/politicians hands is a great way to see if the study aligns with probability. You can see in this palm that the good lines are deeply etched with seemingly very few bad indications. There's a very strong vertical line rising from the lifeline ( pretty much perfectly without crossing the lifeline). You can also see a very strong fate line and sun line that is etched very deeply. Combine these with very few bad indications and it creates a very rare palm. We can see a lot of these patterns with many great leaders, but I'm using this image as an example since the upward lines are deeply ingrained and clearly visible thanks to the lightning and this particular palm. I find this to be interesting since what's the probability of possessing a palm of this nature + obtaining the highest office in the land? Now we also see this with many powerful leaders and there are only so many powerful leaders in the world. We have to keep in mind most palms have a lot of bad indicators or lack some major line or another. I just think this is a good indication that palmistry might have some truth to it, although this proof is certainly not concrete.